A family that had been involved in a high-profile legal battle over life support said they are trying to help Jahi McMath’s family find surgeons to operate on the girl to aid her transfer out of Children's Hospital Oakland, where she is receiving care. The Terri Schiavo Life & Hope Network, which was started by Schiavo's family, said they have been working with the relatives of the 13-year-old California girl to transfer her to a long-term care facility. Jahi was declared brain dead last month after a tonsillectomy procedure. Schiavo, who suffered brain damage after a heart attack, was at the center of a lengthy right-to-die struggle that ended in 2005 when her husband removed her feeding tube over objections from her parents. “Together with our team of experts, Terri’s Network believes Jahi’s case is representative of a very deep problem within the U.S. healthcare system -- particularly those issues surrounding the deaths of patients within the confines of hospital corporations, which have a vested financial interest in discontinuing life,” the group said in an emailed statement. 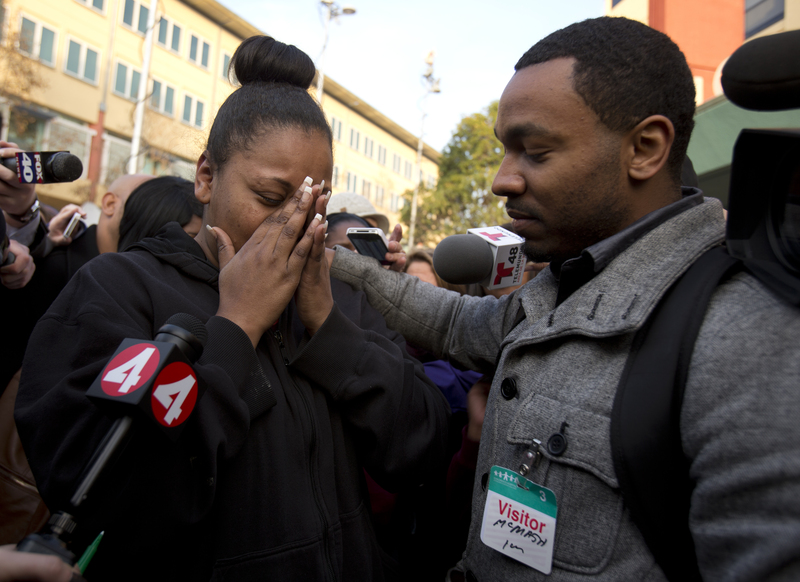 The attorney representing Jahi’s family, Christopher Dolan, said that before a transfer from Children's Hospital Oakland can take place, the eighth grader must undergo insertion of a breathing tube and a feeding tube. Both are necessary for her long-term care at a nursing home, but the facility is not equipped to perform the procedures. The hospital has refused to put the tubes in. "Performing medical procedures on the body of a deceased human being is simply not something Children's Hospital can do or ask its staff to assist in doing," lawyer Douglas Straus wrote in a letter to the girl's family. Hospital spokesperson Sam Singer pointed out in an email Wednesday that the request to insert a feeding and breathing tube has been denied in three different courts since Monday Dec. 30: Alameda County court, U.S. district court and the California Court of Appeals. Hospital spokesperson Melinda Krigel added it has not heard from any facility willing to perform the procedure. Jahi underwent a tonsillectomy and related procedures at Children's Hospital on Dec. 9 to treat sleep apnea. Her family said she went into cardiac arrest after she started coughing up blood in the recovery room. She was declared brain dead three days later. The hospital then moved to take her off the machines that keep her heart and lungs going a few days before Christmas. Her family, citing religious beliefs and the hope that she will pull through, wants to continue life support. Alameda County Superior Court Judge Evelio Grillo initially ruled that doctors could remove Jahi from the ventilator at 5 p.m. Monday, but two hours before the deadline gave the family another week until Jan. 7 to find a place to transfer her. Brain death refers to an irreversible loss of all neurological activity including cessation of breathing and other bodily processes. A persistent vegetative state or coma is not brain death is when a person loses thinking abilities and awareness of their surroundings, while other functions like breathing and circulation remain intact, the National Institute of Neurological Disorders and Stroke notes. “Terri Schiavo was severely brain-damaged with no hope of recovery, but she was not dead, she still had a functioning brain stem,” David Magnus, a professor of pediatrics and director of the Stanford Center for Biomedical Ethics, said last month. “When someone’s declared brain-dead they are actually literally dead," he said. "What’s really happening is blood has been circulating in the body. Certain biological processes with the cells and the organs are continuing, for a body that is no longer a person. They've already passed away." A legal expert noted that the Schiavo and McMath cases highlight the cultural struggles with medical care brought on by advances in technology. “Once you can make dead people look like living people through technology, then the hope that somebody can be brought back from the dead becomes much more powerful,” Georgetown University Law Professor Gregg Bloche, an expert on health law and policy, told CBS San Francisco.